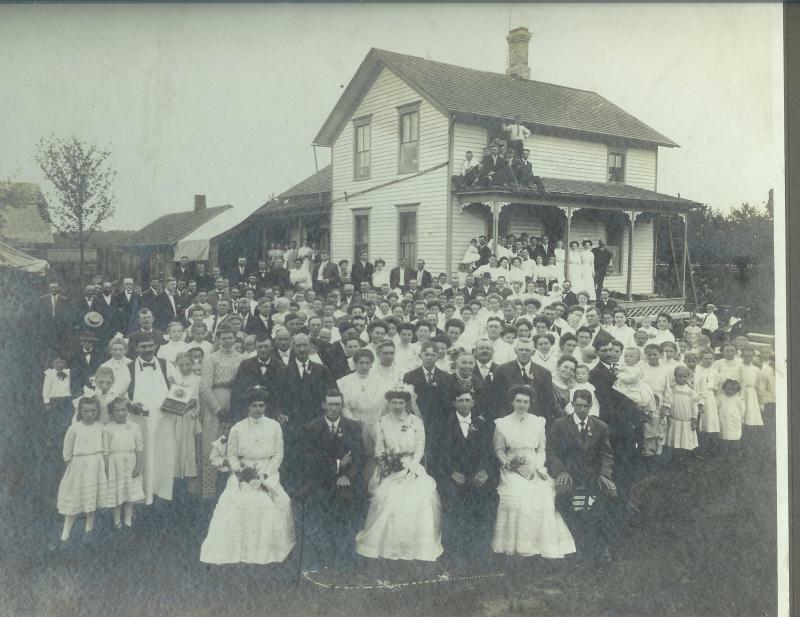 Comments: Groom- Carl Wilhelm Schnell (Nee: ) | Richville Area MI United States | 1901-1920 | Comments: This appears to be a wedding photo of Carl Wilhelm Schnell and Sophie Winkler which took place on August 1, 1909 in Richville, Tuscola County, Michigan. The man seated in the front row, first from the left is C. Friederich Schnell. Seated to next to him is the bride, Sophie Winkler Schnell with the groom, Carl, on the other side of her. Standing in the second row directly behind the groom is his mother, Sally Ursula (Kern) Schnell). The father of the groom, Johann Leonhardt Schnell is to her right. Standing to his right is their youngest daughter, Mary (Schnell) Weber holding a baby and her husband, Georg Mathias Weber is standing to her right holding another baby.